Back to "Managing your website pages"
Expand your website structure by adding as many pages as necessary. What are the differences between pages and subpages? You can add two different types of pages to your website at Voog - main pages and its subpages. Main pages, by default, are displayed in the main menu. Usually, they contain the firsthand information which then may be divided into separate fragments with the help of subpages. Subpage itself usually contains a certain amount of information about a larger topic. For example, if you have created a webpage for your restaurant and added a page specifically for courses, you'll probably need to use subpages to help divide it into smaller options such as side dish, main course and dessert. How do I add a new page or subpage to my site? Click on the '+ Add' icon in your main menu to add a new page to the menu. Adding a subpage is similar, just find it in the menu of a page. The placement of this button varies with design. 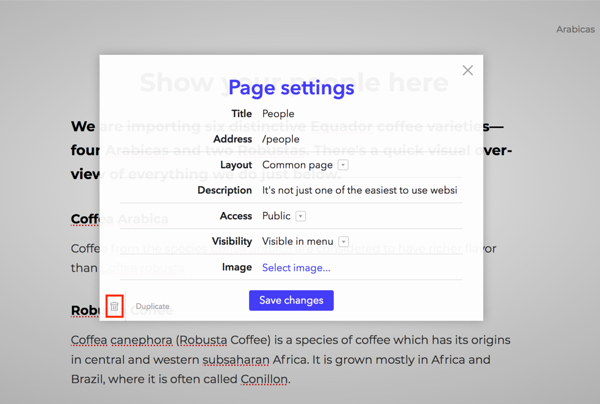 Once you've clicked either of these buttons, a new page form will show up where you can add the page a title, set its address, choose the layout and decide if you want to display it in the menu or not. If you'd like to remove a page or a subpage from your website, you have two different options. The first one is to open 'Page settings' from the lower-right side of your Voog panel and clicking on 'Delete' from the upcoming menu. The second one is to simply proceed to the 'Content - Structure' menu. You will arrive at the site structure, where you'll be able to delete a preferred page by clicking on the thrash bin icon behind it.